If your phone before your Samsung Galaxy S 5 worked with AT&T or T-Mobile, you probably have a SIM card. 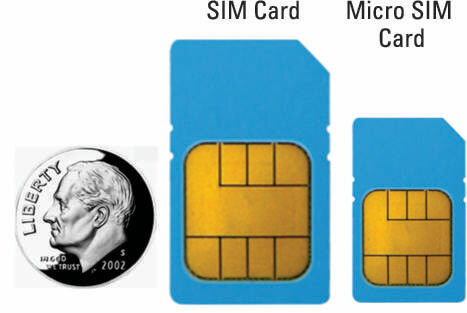 Here is a profile of a typical SIM card, next to a dime for scale, although yours probably has the logo of your cellular carrier nicely printed on the card. To the right of the SIM card is the newer micro SIM card. This is the same idea, but in a smaller package. If your cellular carrier was Verizon, Sprint, or US Cellular, you may be confused. Your Galaxy S5 has a SIM card. What’s the story? These carriers use CDMA technology for voice and for some data features. Up to 3G, the phones using CDMA technology and data services didn’t use a SIM card. Today, all carriers in the US are implementing a super high-speed data technology called LTE, also called 4G. Because your phone is capable of LTE, you now have a SIM card. 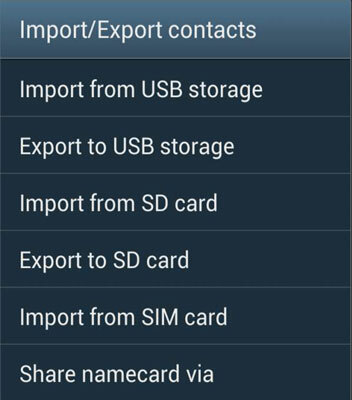 Like many users, you probably have stored your phone contacts on your SIM card. 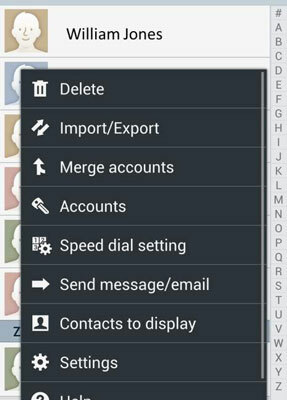 Some GSM-based phones allowed you to store your contacts on internal memory within the phone. This allowed you to store more contacts and more information on each contact than you could on the SIM card. This brings up the Contact menu pop-up. These are all the options for Contacts. This brings up the Import/Export options screen.